That’s what I’m learning bit by bit as this copywriting business is lifting off. Staying focused when there’s no one else around to tell you what your goals are is a challenge. It’s massively rewarding, too — don’t get me wrong — but you’ve gotta shift your mindset to make it work. That’s where the little things can help you . . . stuff like the Seinfeld calendar. Decide what it is that you want to be good at. Get a big calendar and a few thick sharpies. Every day that you work at that “thing,” take a marker and draw a fat “X” through that day. After a few days of this, a pattern starts to emerge. A chain of big, satisfying X’s starts to build up, and you don’t want to break the chain. That’s why it works! Eventually, keeping the chain intact is more important than catching the next episode of Walking Dead, and all of a sudden you’re a professional. 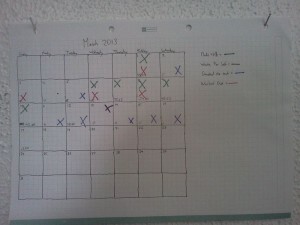 Here’s my own (homemade) calendar. I’ve color-coded and split things into a few categories, but the basic principle remains the same. 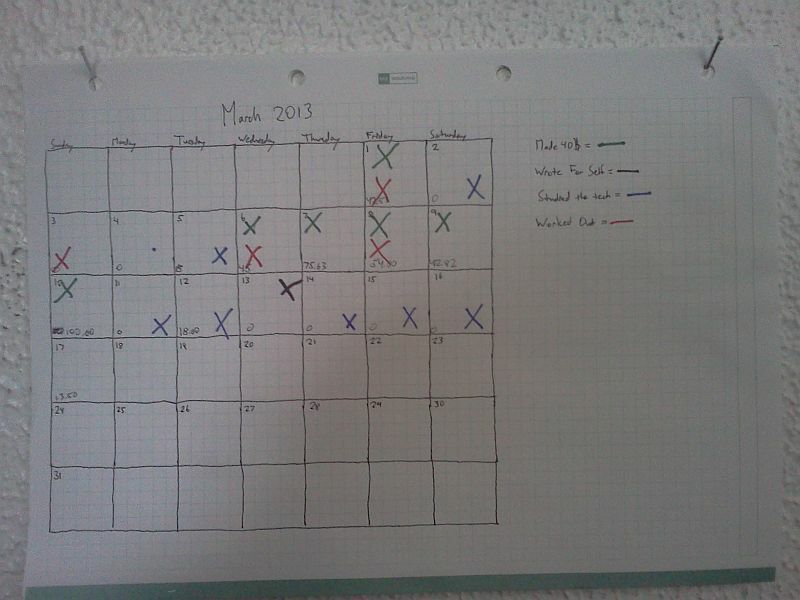 You can see the five blue X’s last week that represent getting this site up and running. It’s nailed to the wall right next to my head so that I’ll always have that reminder. Am I meeting my goals? And if not, are those goals still relevant? That’s the other thing I like about this method. At the very beginning you have to decide what it is that you’re drawing an X for in the first place. That clarity is a powerful thing — and when you struggle to fill the calendar, it’s a good sign that maybe you should reevaluate.